Many of us have grown up with Norman Lindsay's classic tale of the magic pudding; the pudding bowl that never empties no matter how often the pudding was eaten. It seems that the magic pudding bowl has been borrowed by the federal government. The Turnbull government has raised the prospects of delivering new business and income tax cuts. While details surrounding the proposed cuts are limited, the government's rationale for them is clear. For businesses, the tax cuts are all about Australia remaining globally competitive and stimulating economic investment that will deliver more jobs and better pay for workers. The proposed cuts to income tax has a different but equally compelling rationale according to the government. Income tax cuts will provide more money in the pockets of the average punter, who in turn will spend that money, which will encourage increased economic activity. Increased economic activity should lead to greater business profits; and to close off the loop, create more jobs and deliver higher wages. It is all very neat. The economy rarely works as well as the theory might suggest. For the theory to work, people must be rational decision-makers or at least contemplative of the risks and benefits of every decision they make. Human beings are complex creatures who make as many emotional choices as they do rational ones. Most of us marry for love without having done a risk and cost benefit analysis of our future with a new partner. So to infer such positive outcomes from tax cuts is to ignore the complex nature of our economy, the role it plays in our society and the motives and behaviours of the people who participate in it. After some 25 years of consecutive economic growth we still have more than three million people living in poverty. Company profits in 2017 continue the march upwards while wages growth remains low. So low that even the Governor of the Reserve Bank, Phillip Lowe, has raised it as an issue for the Australian economy. In 2015 the Coalition government introduced a range of tax measures including corporate tax cuts for small business whose tax rate is now 27.5 per cent, down from 30 per cent. Small business accounts for nine in ten businesses and 33 per cent of Australia's GDP. They also employ 40 per cent of Australia's workforce, and pay around 12 per cent of the total company tax revenue. Given the significance of the small business sector in our economy why then haven't the tax cuts translated into improved wages growth? "Governments are notorious when it comes to extenuating the positives and diminishing the negatives of their policies. This debate on tax will follow that script." Whether tax cuts do much to improve the wellbeing of employees and the economy more generally is contestable. What is uncontested is that cutting business and income taxes will reduce government revenue. This year the government expects to raise around $433.49 billion in total revenue, with income tax expected to bring in $204 billion, while company tax will deliver $77.8 billion. On the expenditure side, the government expects to spend around $464 billion. The largest area of spending is in social services — around $164 billion, the bulk of which ($109 billion) is spent on the elderly, veterans and people with disabilities. Family support payments account for around $37 billion, with payments and services to the unemployed and sick costing around $12 billion or little more than 7.3 per cent of the social services budget. Spending on health is around $75 billion, with education costing taxpayers a further $33.8 billion. Defence spending comes in at $30.5 billion. Reducing the corporate tax rate and cutting income tax does not come cheap, with the loss to revenue running into several billion dollars each year. The cumulative impact of the original proposal to cut the corporate tax rate for all businesses was estimated to be in order of $50 billion over the decade. Those advocating for cuts will suggest that increased economic activity through investment and job creation will make up for the loss of revenue over time. In its tax reform paper Re-think, the government suggests increased economic activity will offset only between 45 per cent and 60 per cent of the initial cost of the corporate cuts over the medium term. A reduction in tax will inevitably lead to cuts in expenditure and government services. At a time of low wages growth and increasing energy costs, there will be more and not less pressure on the budget as the public look to government to provide them with relief from increasing costs on the household budget. Governments are notorious when it comes to extenuating the positives and diminishing the negatives of their policies. This debate on tax will follow that script. 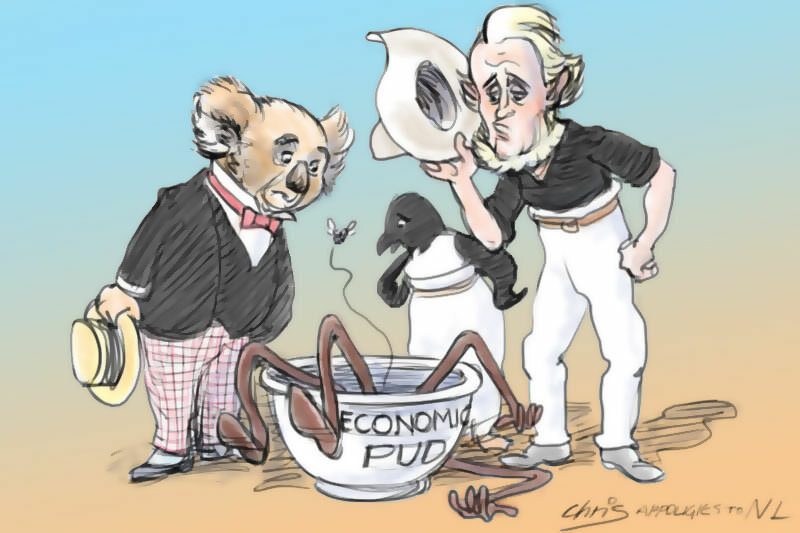 Just like in Linsday's tale, government is trying to make us believe that they have in their possession a magic budget bowl that can reduce revenue without cutting services and negatively affecting the average punter. In the end both are fairy tales but the impacts on society are real and in particular for the poor and marginalised in our society. Joe Zabar is the Director of Economic Policy for Catholic Social Services Australia and author of An Economy that works for All (Australian Catholic Social Justice Council, 2017). If this country has "more than three million people living in poverty" the meaning of the word poverty has been significantly altered. The best way to stimulate an economy is not to cut taxes but increase wages and social security spending. These two “investments” have a high economic multiplier effect as the recipients spend the money almost immediately. One of the massive costs of privatisation has been a decline in real wages. As Henry Ford did a century ago, to pay your workers more has several flow on effects. It increases their ability to expand markets and it provides a yardstick for other employers to reach to get the best workers. The small gains, if any of efficiency, of privatisation are hugely offset by pressure to contain wages growth, deflate the taxation base and increase social services spending. Spending on social services is a magic pudding, it generates more wealth and eventually decreases the need for that spending. Well written and very good analysis of the failure of neoliberalism as policy. Attention needs to be given to the outrageous salaries paid to executives that would enable wage increases to workers who make the profits. The most obvious way to raise additional revenue would be to raise the GST and compensate low income people. If the rational consumer existed in reality we would not need the doctrine of Original Sin. But where the scramble to share in the limited resources of Mother Eaeth is concerned factors other than rationality come into play. And play is the word for the situation becomes a game in which there are winners and losers. A league table evolves with some players/teams becoming entrenched in the top 10%. The other 90% can only hope that they can improve their position by playing against one another in conformity with “rules” devised by the top 10%. You are quite right on so much of what you say Joe, but it is much easier to talk in generalities than to formulate policies, and then get them through a dysfunctional parliament with a dedicatedly negative opposition. I presume that Mr Turnbull is assuming that the extension of corporate tax reduction won`t occur and so he can use the "savings" (i.e. less increase in debt) to do something for lower paid workers to avoid them moving into higher tax rates as economic growth and wages pick up...surely a good thing in itself. I quite gee that there should be more redistribution of wealth to community who are struggling but that will require increases in consumption taxes (hopefully relatively protecting basics...and of course tampons!) and wealth taxes, including on family homes, say in excess on $1.5 million, in a graduated way. But just imagine the zingers from Mr Shorten, Get-up! etc etc if the government actually tries such sensible but radical policies to get us out of the current fiscal morass? The magic-pudding is now an endemic social and political concept I`m afraid; woe-betide anyone who tries to suggest some financial reality. Populist give-aways are so much ...well popular!